Why I’ve had bariatric surgery. The past few months has been a whirlwind for me. We’ve bought a house, totally redecorated the house and moved into our new house. More importantly, I’ve actually undergone bariatric surgery. This is a decision that I didn’t make lightly, and a process that I’ve gone through since October 2016. Now, as a plus sized woman who is proud to be plus sized and actually identifies as “fat” this has been tough for me. I don’t want people to think that this has anything to do with how I look or my size because it isn’t. I love how I look and I believe that fat bodies can be healthy but unfortunately mine wasn’t. I was diagnosed as type 2 diabetic and also diagnosed with severe obstructive sleep apnea and I knew something had to change otherwise I wouldn’t live as long as other people. Me and Adam also want to have another child and I just couldn’t go through another plus size pregnancy. Some people breeze through but for me it was physically and mentally (which was worse) exhausting. I just couldn’t do it again. I made a choice for my own health and to benefit my family and I hope it will be worth it. My journey started in October 2016. During a routine appointment with my diabetic nurse she mentioned bariatric surgery but I told her I wasn’t interested. She went on to say I could do weight management with the GP whilst I waited for my hospital referral and I could make a choice later. My hospital referral was going to take around 6 months and even then I wouldn’t have to make a decision straight away. I did the weight management with the GP which included seeing a dietician, a psychologist and the diabetic nurse. The dietician gave me a short term goal to try and eat breakfast because one of my issues was I didn’t eat till early afternoon then I’d have 2 large meals or pick all day at junk. The psychologist appointment was really positive and she thought I was in the right frame of mind for the process and it was really positive. All through the process every member of staff has been kind, supportive and really friendly. A massive difference to when I was pregnant. I started losing weight and lost just over a stone and then started slimming world in around march just before my hospital appointment. My first appointment at the hospital was the surgery seminar where we would learn about our options and which surgerys were available. There was three main ones, Bypass, mini bypass and sleeve. I liked the look of the mini as it was less complications and I was coming around to the idea of surgery as got to see success stories and speak to somebody who had had it done. I also then joined a facebook group for people having surgery/had surgery at our local hospital. They then did my height and weight and calculated how much I would have to lose to qualify for surgery. You have to lose 10% of your excess weight. I was 139KG and I had to lose 7KG by the time I saw the surgeon. Next up was a whirlwind of appointments. I had to see another psychologist who was amazing and he referred me for counselling and wanted to see my again. On the second visit he okayed me for surgery. I had to be okayed by several departments before I could join the waiting list. My next visit was to the diabetic doctor who signed me off straight away and then I had to wait for the sleep clinic and the surgeon. Unfortunately my first home sleep test (a box on your wrist and probe on your finger) failed and I had to re-do it with a different box which made the process longer. Whilst I was waiting for my appointment with the surgeon we went on our first family holiday abroad. We went to Ibiza at the end of September 2017 and I was terrified. I thought I wouldn’t fit on the plane, that the seat belt wouldn’t go around me and that everybody would be staring at me. I worried for nothing! My seat belt fit going there and it fit in the first seat I sat in going back however the two people sat next to Adam didn’t turn up for their flight and so I moved to sit next to him as we had booked aisle seats each not actually together. When I moved into my new seat the seat belt didn’t fit (despite fitting in the one I was sat in 30 seconds earlier) so i quickly rang the buzzer and got an extension. The stewardess was discreet and it slipped on easy. I never noticed anybody staring at me on holiday, in fact there was quite a few plus size mums so I wasn’t the only one. It felt nice! We even made friends with a lovely family and it was just an amazing holiday. We got back to reality and I psyched myself up for my appointment with the surgeon. I had lost the weight required (despite being all inclusive) and was nervous but excited. After meeting with the surgeon we agreed that the mini bypass was my best option and after my sleep appointment I would be put onto the list and I would then have all the pre operative appointments. My next appointment was the liver reducing diet. Before the operation you need to do a special diet for 1-2 weeks with the aim to reduce the size of your liver which will make the surgery easier as it is done keyhole. It was quite a basic diet and you followed allowed foods from a list. This was in December 2017. January 2018 came around and I finally got my appointment at the sleep clinic. They agreed to give me a new machine for my sleep apnea as I didn’t get on well with the last one and I got a new mask too. This machine massively changed my life and for the first time in about 5/6 years I finally felt rested. At the end of January I had my endoscopy appointment. An endoscopy is when they put a camera down into your stomach to look at it and they also took a biopsy of my stomach. 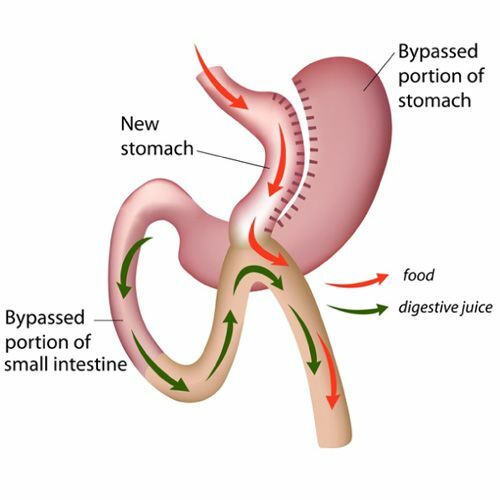 They do this because they staple and seal your stomach creating a new tiny stomach but they leave the rest of the stomach in there too as you still need the gastric juice. Not gonna lie, endoscopy’s are disgusting and I never want another one. I did it without sedation and just listened to the surgeon and nurses but it was brutal. I was then told by my surgeon to expect a surgery date in March/April. However this didn’t happen. In fact I didn’t get a date until October due to the hospital being super busy over winter and a miscommunication between the sleep team and the bariatric surgeons administrators. The sleep team sent them a letter okaying me for surgery and they didn’t receive it, until I rang up querying my lack of date and they found the letter. I was finally put on the list properly in June 2018 and promised a date by around September. With this in mind me and Adam decided to cancel our family holiday in September. We were supposed to be going with loads of family but didn’t want to pay it off for me to not go so we cut our losses and cancelled. We did however go ahead with the purchase of a house which we finally completed on in August and moved into at the end of August. We were keen to get the house ready to move into and not have to do any work later and so we worked flat out for two weeks to achieve this. We moved in and I finally got my letters for my pre op and operation. I knew the date though because I had been ringing every few weeks and I was told over the phone. I had my pre-op on September 19th which entails blood test, weight, ECG, MRSA swabs and an appointment about anaesthetic which lasts around 2 hours. The day after I started my liver reducing diet for two weeks. These are a few of the meals I ate on my pre-op diet. I ate a lot of handmade lean mince burgers, meatballs, quorn chicken stirfrys with courgettie spaghetti, stuffed peppers/mushrooms and turnip chips. It actually wasn’t bad at all and I was really full the whole two weeks. Operation day rolled around. The day before was awful and I couldn’t stop crying or writing mental “if I don’t make it” letters in my head. Eleanor slept at Adams mums the night before as I had to be there for 7:15 and as soon as she left I sobbed. I cried my eyes out actually. I was an emotional wreck the night before my op, me and Adam went to bed early, had a long talk and just hugged each other. I woke up early on operation day and put the last bits in my bag, then Adam drove me to hospital and dropped me off. I cried all the way to the surgical ward and waited for it to open. It opened at 7:!5 and I went straight onto the ward had bloods, urine samples, was weighed (I was 120KG), put my compression stockings on and got gowned up. I had to speak to the surgeon, nurses, anaesthesiologist and sign forms to allow them to give me blood, fully open me, do an alternative surgery and accept that theres a tiny mortality rate. Pretty terrifying really! Then came the time to go down to theatre. I walked there in my gown, slippers and dressing gown and the laid me on a table propped up with a squishy mat under my feet. I laid there crying and trying to calm down whilst talking to the people working away and they quickly put my cannula in. Last time I knew it was 9:15 and I slipped into sleep quite easy. Next thing I knew it was 11:25 and they were waking me telling me the operation was a success. I stayed in recovery until 4:30 because despite them booking a bed for me weeks ago, there wasn’t any available. I felt immediately sick and in slight pain so they kept me topped up with anti sickness and some pain relief and I was restricted to 30ml of water per hour. I couldn’t leave the trolley, couldn’t really roll on my side and I didn’t have any of my belongings. I just had to sit and wait. Finally got back to the ward after 4:30 and was placed in my own side room. Managed to transfer beds myself without help and started to feel a bit better. I was hooked up to two drips and I finally got my phone and glasses back so I contacted my family and let them know I’m okay. Adam came to visit me and I was allowed some time off the drip so Adam could take me for some fresh air and for a bit of a break from the room. Adam helped me put some fresh pj’s on and finally left. I was managing to walk myself to the toilet (with drip) and generally feeling 1000 times better than I expected. I settled down with some wordsearches and my phone and managed to sleep. The second day I had no pain relief and only anti sickness on the morning and I was allowed to drink more fluids. The morning was boring, just lots of visits for blood sugars, blood pressure, IV changes and my stupid IV machine buzzing like 5 times an hour. The physio came and was shocked I was up and walking and said I didn’t need them, but I managed to persuade them to go for a walk with me out of the ward and back so I could stretch my legs. By the time afternoon came my beautiful friend Hollie came to visit me like a breath of fresh air. She made me laugh and I was so grateful for her being there. Adam and his mum also came to see me and once again Adam took me out in a wheelchair around the hospital. Adam left and I bought a TV package (which was extortionate) as my phone signal wasn’t good enough to watch things on and I watched a few films. I managed another decent nights sleep and anticipated going home the next day. Friday came around and I was finally allowed my cannula out. This felt amazing because I had two IV’s in and my hand was throbbing. Also the machine kept beeping and getting blocked and was generally a pain to drag to the toilet all the time. I also started on food again. For my first meal I had a tiny bit of toffee yoghurt which I managed well and I had some soup for lunch. I was so scared to eat but it wasn’t bad at all, but was really strange getting full off tiny amounts. Then I sat and waited to go home. I was told lunchtime but due to my meds not being prescribed on time they weren’t brought on the lunchtime round and so I had to wait till 6. Adam came to collect me and I was finally discharged after 6:30. I was packed up, ready and waiting at the door. Once my meds came I was out! I was so happy to leave hospital. Being away from Eleanor for so long broke me a little bit. It just felt unnatural to be away from her and I cried missing her. I went straight to Adams mums house where Eleanor was staying and was so glad to see her. Poor Adam hadn’t seen her too as he had been coming to the hospital and she had been sleeping at his mums. She was so sweet with me, wanted to inspect my tummy and kept asking if I was okay and if the doctor had made me better. Me and Adam left again and Eleanor stayed there as she was going to Disney on Ice the next day with Adams gran and sister and she came home to us after. Waking up with Eleanor Sunday morning was amazing. I had missed her so much!! She actually went back out that night to stay with my cousin Carley till Tuesday because we had arranged it when I thought I was going to be more poorly. I used those few days to rest and relax and get into a routine of eating little and often. Since then I’ve been going from strength to strength. I’ve got back into a bit of a routine, and I’ve been on days out but I’m trying not to do too much and I’ve avoided heavy lifting. I’ve already noticed small changes which is weird. As much as I haven’t done it to change my body, I am excited about some aspects like fitting into Primark clothes….and cheaper clothes in general. Plus sized clothes are a fortune!! I just wanted to give a massive thank you to our amazing families who have just been amazing. My mum for being my supporter, Adams mum, sister and gran for looking after Eleanor so well and my cousin Carley and her boyfriend Jamie for having Eleanor for a couple of nights (even if she did come home wanting a puppy). Thank you to my friends. Tina, Emma, Katie, Beki and everybody else who I’ve spoken to daily and who has been a huge support system for me. Huge thank you to my followers and friends on instagram who kept me occupied with questions, instagram lives and who reached out with supportive comments and messages. They meant the world to me and I was genuinely overwhelmed with the response. The amount of love and support was unreal and I feel like it made the hospital stay that little bit easier. Thank you to Eleanor for being my inspiration, for looking after me and asking me if I’m okay and for keeping me amused with your funny antics. I couldn’t ask for a better kid. Finally a massive thank you to Adam. My rock, my better half and my best friend. From visiting me, supporting me, looking after me when I was having a few wobbles, making me food, making me rest and just generally being an amazing man as always. You are such a wonderful person and I’m so very lucky to have you. Who knows what i’ll look like in a years time. That’s not what matters to me. What matters to me is that my health improves and I’ll be around longer for my family. Thats why I’ve gone through this whole process. Apologies for the long post. I’ve been asked about how, why, the process and how I’m recovering so I thought a whole post with everything in would be best. Previous Post Jumping on the trend. Featuring THE eBay dress. Next Post A return to The Curve Fashion Festival.